Diamonds and gold – as long as you have sufficient diamonds and gold, you essentially have a chance to get any in-game resource through the bar system. Here we are going to give a brief introduction on how this works and how you can spend your diamonds and gold more efficiently. A single diamond draw requires 240 Diamonds, or you can draw 10 times in a row to get a 5% discount for a total of 2280 Diamonds. 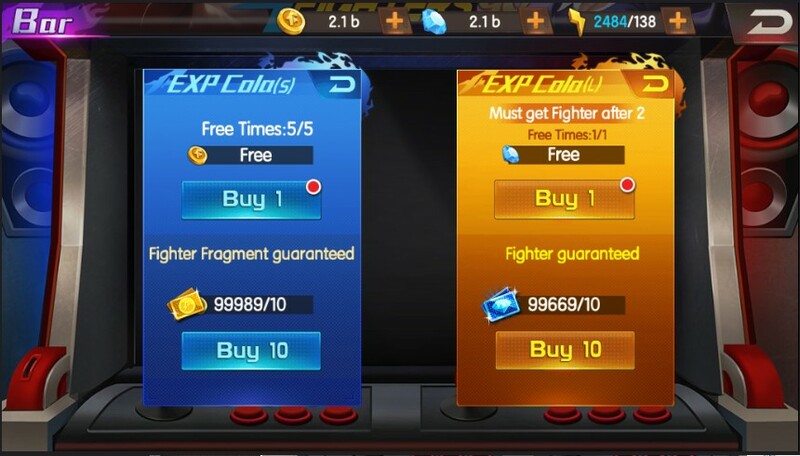 Note: Fighter is guaranteed for first time diamond draw, and a 4 star fighter is guaranteed for the first 10 times draw. A single gold draw requires 20,000 Gold, though you get 5 free draw chances every day. 10 times gold draw requires 180,000 Gold, which is 10% off, an even bigger discount that the 5% from diamond draw! 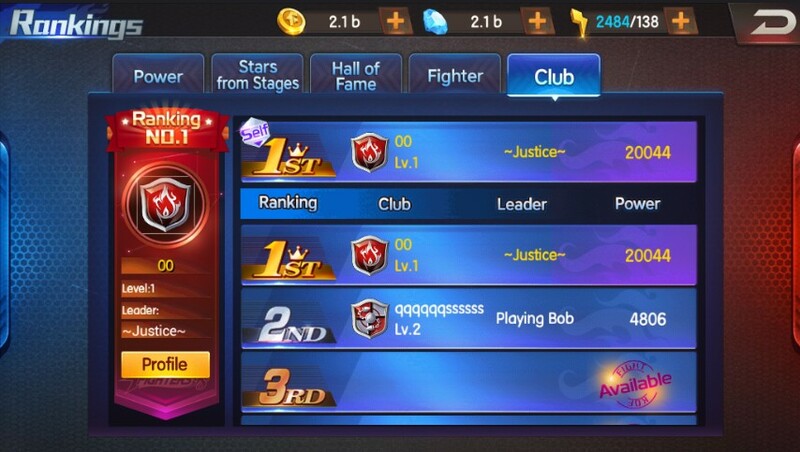 The bar system is a key source of fighter recruitment in early game, you can recruit powerful fighters here to boost your ranking in the arena and other events, so that you can get better rank rewards to recruit even more powerful fighters. So give the 10 times diamond draw a go, who knows, maybe you might even get lucky and get Yamazaki or Iori! As the saying goes: "Strategy is about making choices, trade-offs; it's about deliberately choosing to be different." 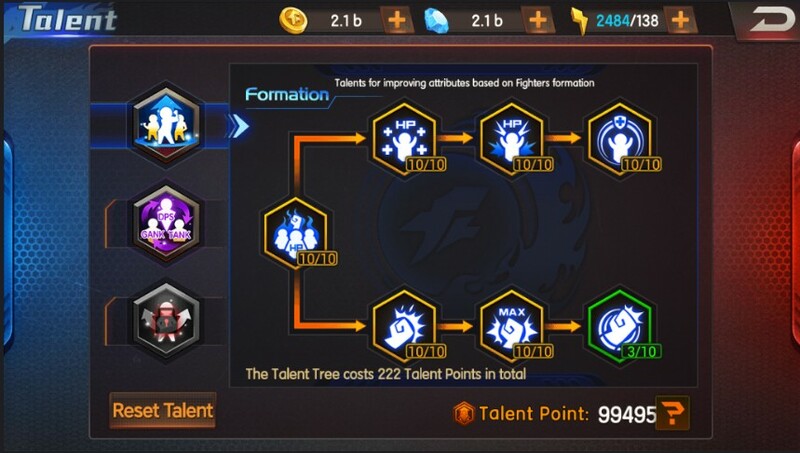 The following will introduce the talent system, which can be a useful tactic in addition to fighter’s formation. The talent point system allows players to give targeted boosts to certain fighters, which can allow players to tailor their team to be more effective against certain fighting styles. 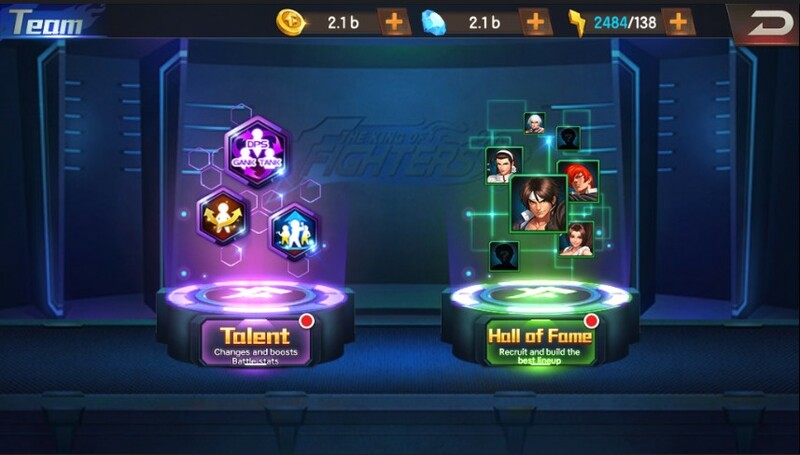 As shown below, players can obtain talent points from campaign chests or arena, which can then be used to provide boosts to its front or rear row fighters. 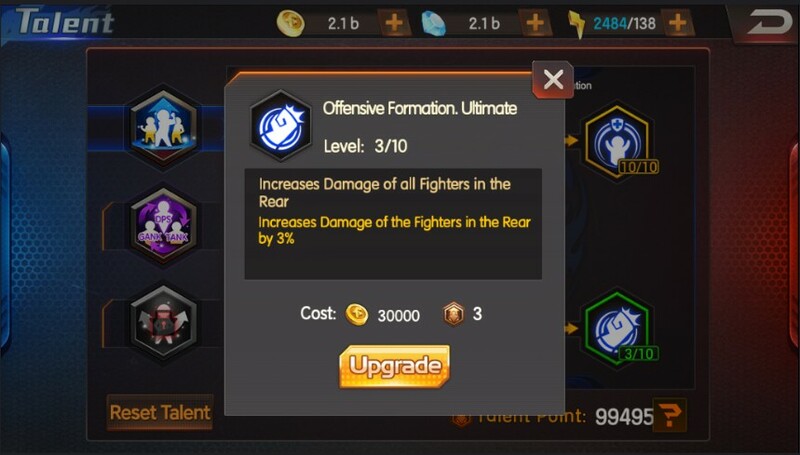 If you think that the front row fighters aren’t tanky enough, simply apply the talent points here accordingly to give your front row fighters a HP boost. As your level increases, you will spend more talent points and will unlock more talent trees that can provide boosts to specific fighter classes and even boosts effects against specific fighter classes. Go create the best fighting team, strategize and win! You can strengthen your fighters by upgrading equipment and enhancing fighters’ base stats. 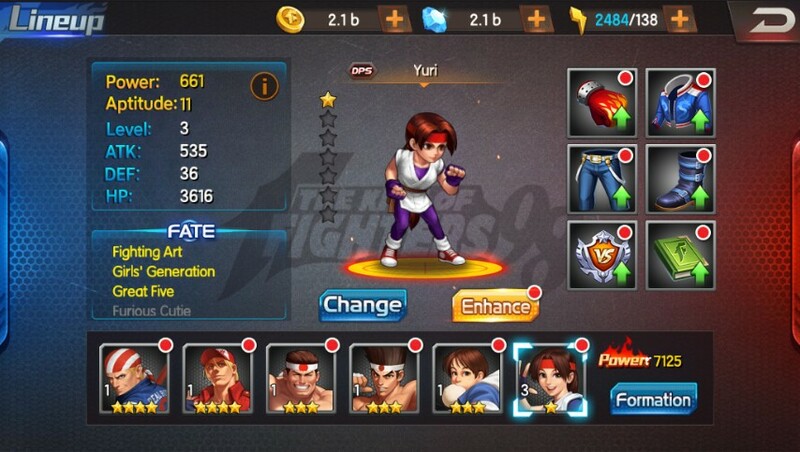 First, click on any of the fighters on the in-game home screen, which will bring you to the interface shown in the below figure, where you can strengthen fighters through a few different methods. As shown in the figure below, each fighter has 4 equipment: weapon, shirt, pants, and shoes. There are also Badges and Tomes. Each one will enhance the fighter's combat power. The higher the level of equipment, quality of items and fighter stars, the stronger the Fighter will be. Click on the equipment icon to enter the equipment upgrade interface. "Level" can be increased using gold coins, there is also a ‘quick upgrade’ button to help you speed things up. "Promotion" required items can be acquired through campaign or drawing in bars and opening certain chests, these are necessary to promote the item quality in order to further upgrade the equipment level. 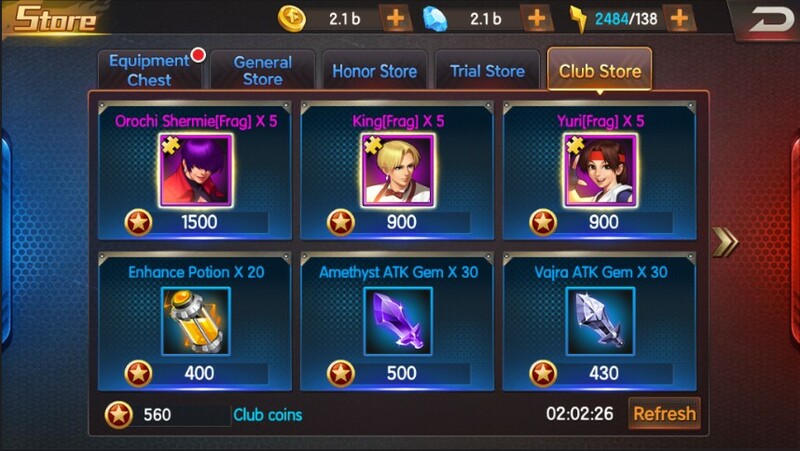 "Awakening" can be done by acquiring awakening gems through opening equipment chests in the store as well as through events. Some weapons require an additional item to awaken them to the next star level, but trust me, they are worth it! "Badge" and "Tomes" upgrade materials can be acquired from ultimate trial, honor stores and other shops. 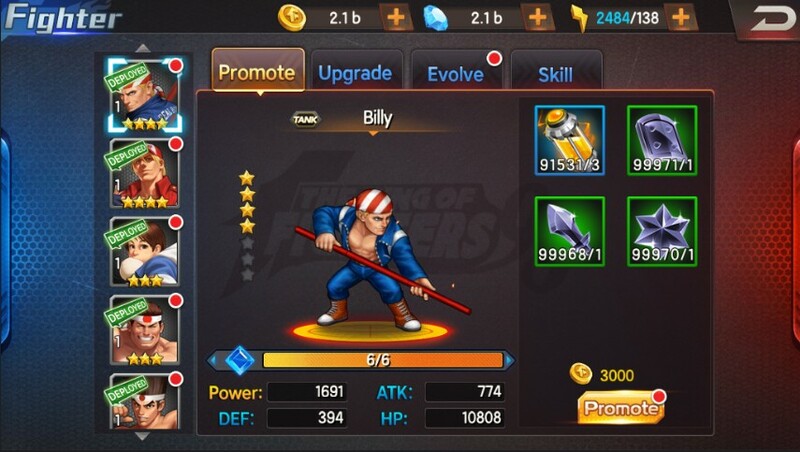 There are 4 ways to enhance the base combat power of each fighter: promote, level up, evolve to next star level and skill upgrades. 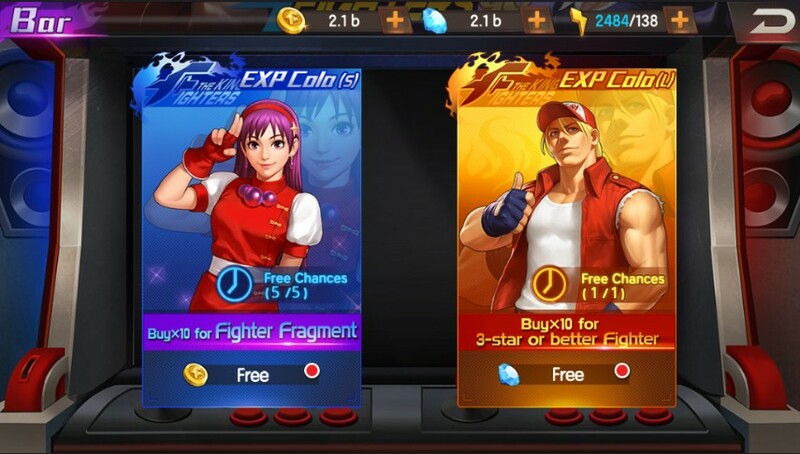 "Upgrade" can help boosts your fighter’s level quickly by drinking some EXP Cola, which can be acquired through campaigns, chests, and more. However, your fighter level can’t be higher than your team level. "Star level" can be increased by acquiring fighter fragments from elite & hell campaigns, as well as chests, events and more. Increasing a fighter’s star level can boost base stats and unlock more advanced skills. "Skills" can boost the damage or effectiveness of well, a fighter’s skills. This can boost active and passive skills. 1 skill point is regenerated every 5 minutes, though if you are VIP 2; the regeneration time is reduced to just 1 minute! Overall, the strengthening system is use to enhance a fighters combat power. So, if you want to become next King of Fighters, go enhance your fighters’ combat power through the strengthening system now! Want to take part in heated KOF battles with like-minded individuals and friends? The KOF club system opens the window to a world filled with talented fighters, allowing players to say goodbye to the once dark days as a lone wolf. Meet other talented fighters, band together, make some friends, and fight your way to the top together! Minimum level requirement, only players that reach the required level can apply. Join club conditions: Level 20+ players can apply to join clubs; successful acceptance depends on club recruitment settings. Here you can contribute to club through donations and engage in technological research. 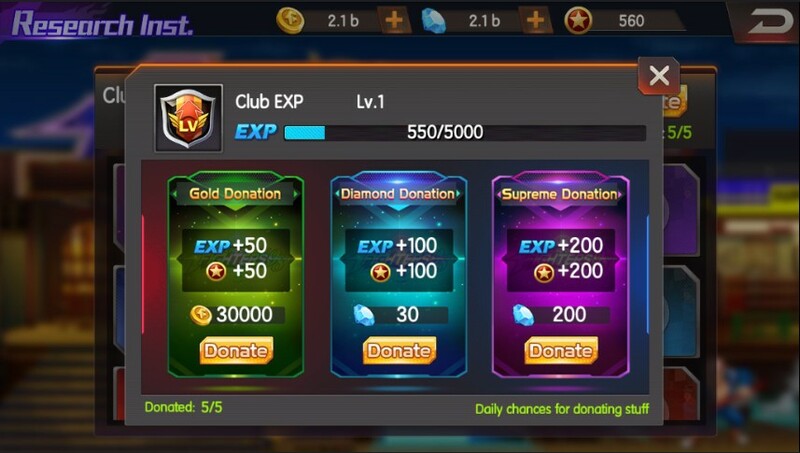 Club donations: all club members can donate gold or diamond, while VIP5 players can contribute supreme diamond donations. Each player can donate a maximum of 5 times. Donations provide experience to the club, which is necessary to increase club level and unlock additional club features. 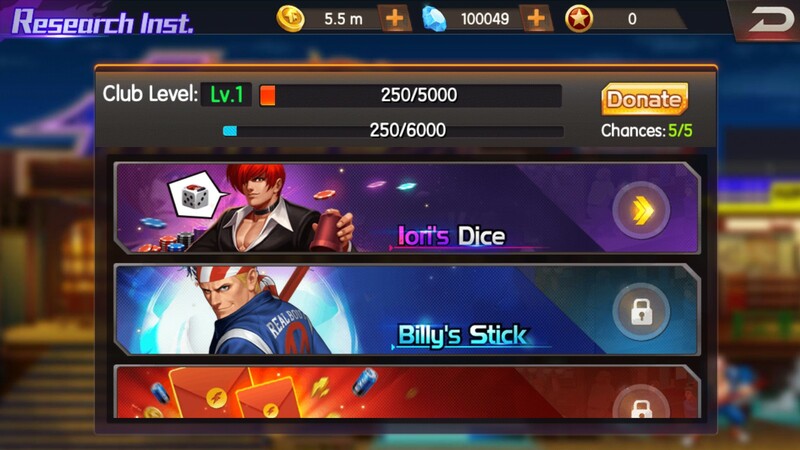 Once the mini games such as Iori’s Dice, Billy’s stick or Lucky Bag has been unlocked, you can also donate to these in the research institute to boost their return. Note that this still counts toward the maximum of 5 donations per day. Clubs are ranked according to club level and total club experience. Members can use the Club coins gained from Club contributions to exchange for useful items here. The store will be refreshed at 21:00 every day, or you can also use a little diamonds to refresh immediately. VIP system identifies how many diamonds you have recharged and what additional privileges you can enjoy. VIP level increases automatically as your total recharged Diamonds meet the VIP level requirements, and with that, your corresponding privileges are also increased. Details of privileges and diamond requirements are shown in the below figure. Recharging 60 Diamonds can get you the fiery Mai and recharging to V10 can even get you the legendary Iori! Which VIP level has the best value? 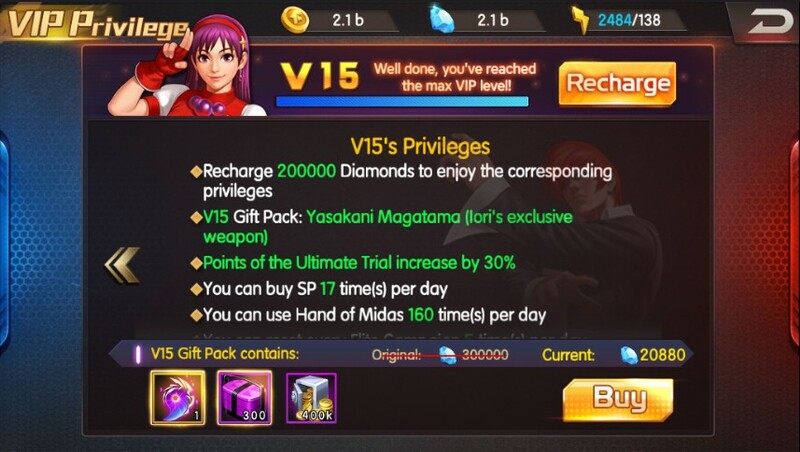 Apart from continuing to recharge Diamonds after reaching VIP15, each of them provides some benefit, so it’s really up to you as to whether it’s suitable or not. Below is the required number of total recharged Diamonds for each VIP level. Note that each VIP level includes all of its lower VIP level privileges, though it does not stack.